Like Emma Bridgewater? Click here to view the entire range. 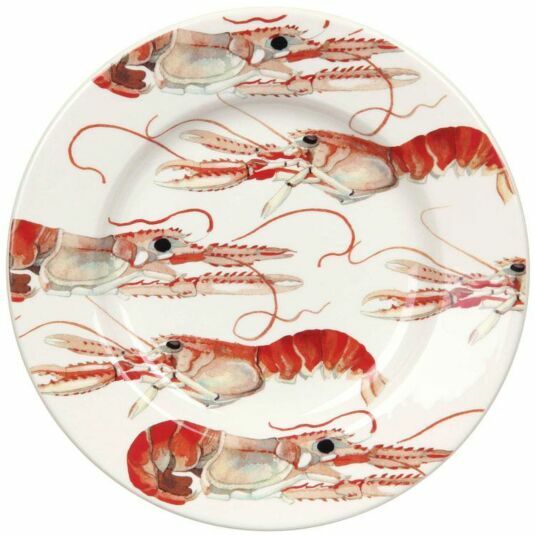 If seafood is your pleasure, you will love this beautiful pair of plates from Emma Bridgewater. 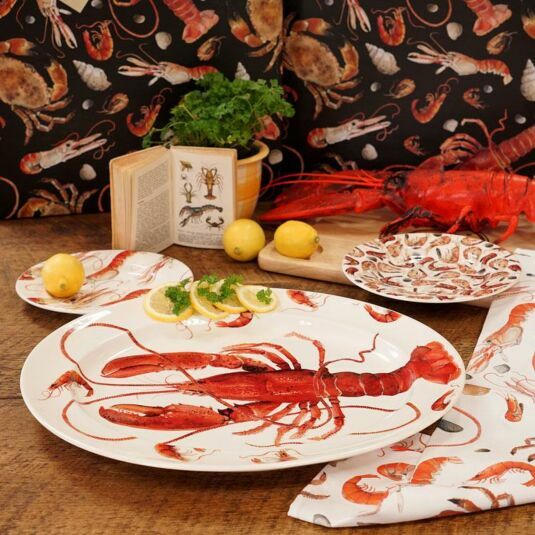 One is decorated with images of Langoustines, also known as the Norway lobster or Dublin Bay prawn. The crustaceans have been lovingly drawn and coloured in orange and brown by Matthew Rice in careful detail. 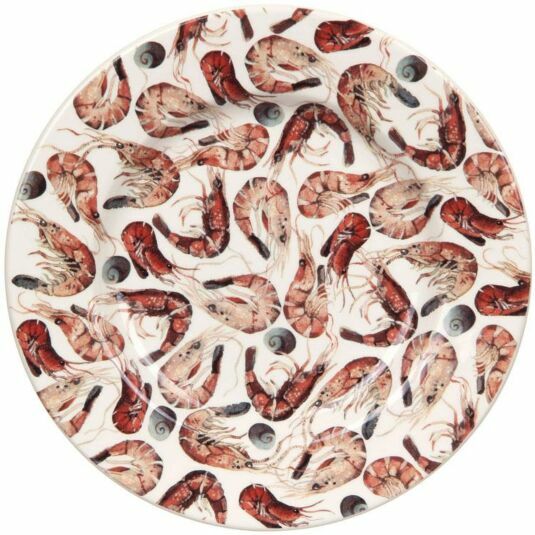 He has also illustrated the brown and pink shrimps which form an all over pattern on the second plate, with an equal delight in the subject. On the reverse of each plate are lyrical descriptions of how to prepare and eat the seafood. 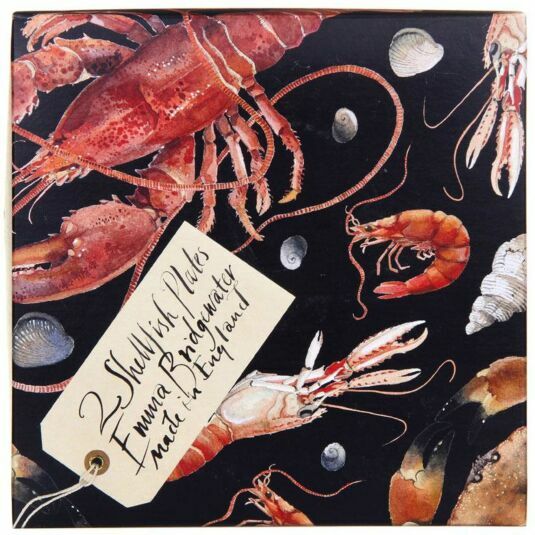 The two plates come in a black box, decorated with illustrations of shellfish including crabs, with the same enthusiasm and finesse as the images on the plates themselves. 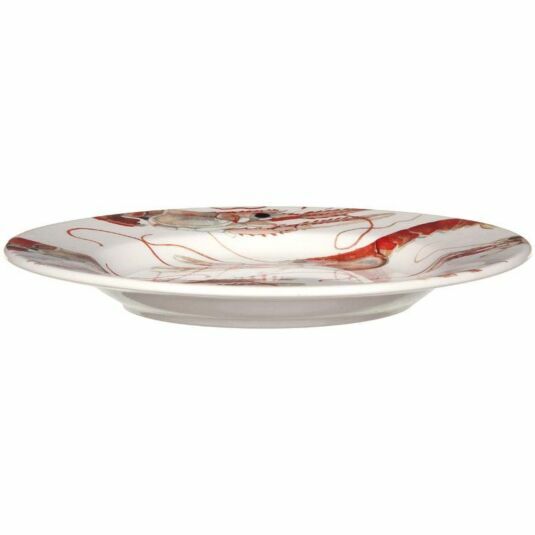 Presented in the beautiful box, these plates make a lovely gift for foodies, newly-weds and homemakers and in themselves are collectible items. Dishwasher & microwave safe. Lower temperature wash and liquid detergent recommended to maintain appearance. 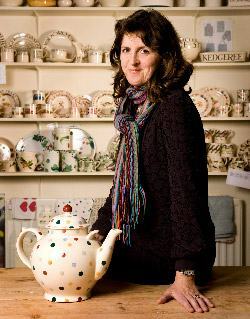 Emma Bridgewater’s English earthenware is hand-made in her factory in Stoke-on-Trent, Staffordshire in England. The Fish range originated during a holiday in Norfolk when Matthew Rice bought a feast of shellfish for lunch – and couldn’t resist drawing it. 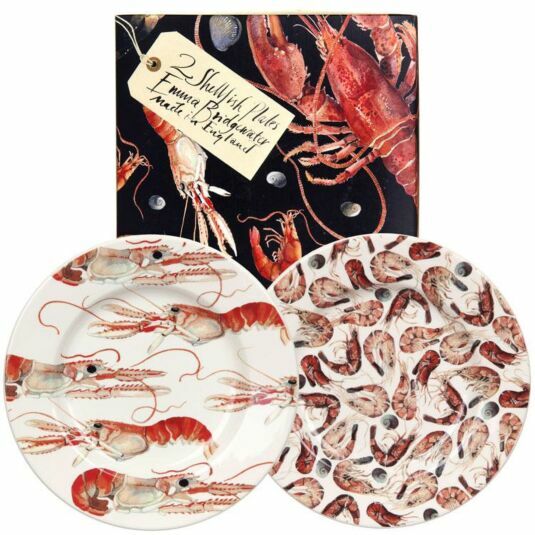 Now extended to include all kinds of watery creatures from crabs and prawns to mackerel and salmon, Matthew’s fine eye for detail and delicate colour has brought this range to life. 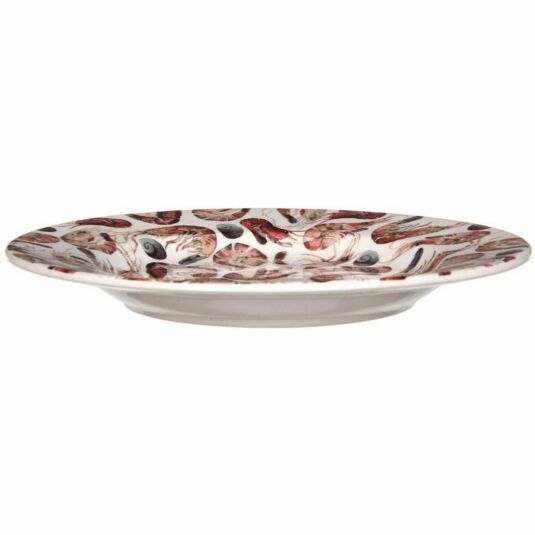 The Fish range looks wonderful together and also mixes beautifully with other Emma Bridgewater ranges, such as Black Toast. Emma Bridgewater is a brand that captures the imagination. It features iconic designs based on simple, uncomplicated elegance that are fresh and original, yet true classics as the same time. Established in Stoke over 25 years ago, Emma's thirst for creative design has led to an expansion from her range of pottery to a huge variety of different products, all of which are intended for everyday use. The company was born in 1985 when Emma, seeking a simple cup and saucer, found the options lacking. The choice seemed to be either much-too-formal fine bone china, or clunky earthenware. It was the need for a middle ground that propelled Emma to create her own range: practical and reliable pottery but with a colourful and stylish design worthy of any kitchen. Working together with her husband, Matthew Rice, Emma Bridgewater has created a multitude of recognisable designs, from the Black Toast range to the Polka Dot and Starry Skies ranges, all of them as collectable as each other. These fashionable creations have earned her many enthusiasts, and we're proud to say that TemptationGifts is one of them!